Rectangular high polished piano rosewood quartz timepiece featuring silver accented Roman numeral hour markings. Product Size: 4 1/8" x 5 11/16" x 1 1/4" Imprint Size: 2 1/4" x 5/8". 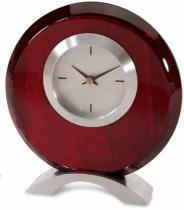 Circular high polished piano rosewood quartz timepiece with brushed silver metal arch base. 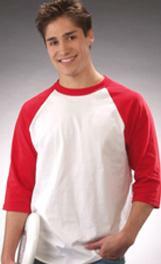 Product Size: 6 11/16" x 7 1/4" x 1 5/8" Imprint Size: 2 1/2" x 1". 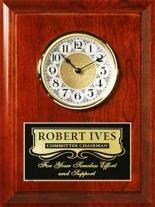 High polished piano rosewood world time clock with a global decor and stunning glass cover. Product Size: 4" x 5 1/4" x 5 1/4" Imprint Size: 2 1/2" x 3/4". 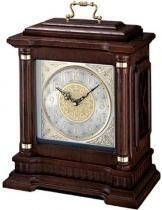 Vertical inlays add subtle drama to this Rosewood Inlaid Mantle Clock! Great for executives Batteries included Each piece is made of a naturally occurring material, slight variations may be present. Materials: Rosewood Product Size: 9-3/4"w x 10-1/8"h x 3"d Imprint Area: Plate (Standard): 3-1/4"w x 1"h. Packaging: Gift boxed Pack Of: 1 Weight: 4 lbs. Dark brown solid oak case, Glass crystal, Westminster/Whittington quarter-hour chime, hourly strikes, Nighttime chime silencer, Volume control, One C battery included. Cherry finish solid wood case, Glass crystal, Metal handle, Westminster/Whittington quarter-hour chime, hourly strikes, Volume control, Nighttime silencer. 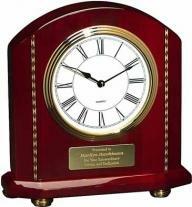 The Americana Wall Clock is made in the USA! A stunning combination of rich wood and a classic timepiece make this award a stunning addition to any workplace or home office. Choose this award for your next recognition occasion! Material: American Cherry Dimensions: 9" x 12" Plate: 3" x 4-5/8" Image Area: 1-1/2" x 3-1/4" Packaging: White Corrugated Weight: 2 lbs. Dark brown solid oak case, Metal accents, Glass crystal, Pendulum, Westmenter/Whittington quarter-hour chime, hourly strikes, Volume control, Nighttime silencer. Dark brown solid oak case with hand-rubbed finish, Glass crystal, Ornate metal dial features intricate vine pattern, Applied numerals, Westminster/Whittington quarter-hour chime, hourly strikes, Brass handle, Nighttime chime silencer. 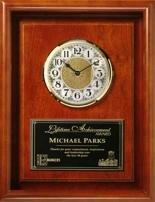 The Americana Framed Wall Clock is made in the USA! A stunning combination of rich wood and a classic timepiece make this award a stunning addition to any workplace or home office. Choose this award for your next recognition occasion! Material: American Cherry Dimensions: 10" x 13" Plate: 3" x 4-5/8" Image Area: 1-1/2" x 3-1/4" Packaging: White Corrugated Weight: 2 lbs.